The Bowdoin Marine Corps Society is an organization of Bowdoin College alumni(ae) who have served or are serving in the United States Marine Corps. Our mission is to connect Bowdoin Marines, provide financial assistance to Marine veterans and their children, assist in the recruitment of qualified Marine veterans for admission to Bowdoin, mentor Marine Corps officer candidates and aid the College in bridging the civil-military divide through an annual lecture series and other means. BMCS was conceived by Jack Abbott ’63, P’00 and Gil Barndollar ’04 in 2014. Jack enlisted in the Marines in 1962 and served until 1965, when he returned to Bowdoin to graduate in 1966. Gil was commissioned as a Marine Corps Second Lieutenant in 2009 and served as a Captain, USMC, until 2016. In 2015, Gordon Linke ’50 joined Jack and Gil as a founding member of the Society. Gordon served as a Marine Captain during the Korean War, 1951-1953. • The Bowdoin Marine Corps Society Scholarship Fund to benefit Bowdoin students who have honorably served in the United States Marine Corps and sons and daughters of active duty, reserve, retired or deceased US Marines. Particular attention will be given to those students who are children of US Marines killed or wounded in combat and have demonstrated financial need. 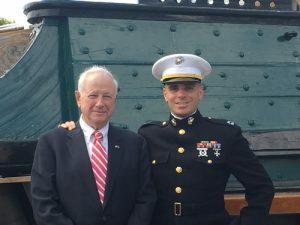 The long-term goal of the scholarship is to supplement the Post 9/11 GI Bill benefit of a former Marine, enabling at least one Marine to attend Bowdoin at all times. Bowdoin also participates in the U. S. Department of Veterans Affairs Yellow Ribbon Program in assisting veterans’ education with financial contributions. • The Everett P. Pope Lecture Series to provide students and the Bowdoin community with speakers on military and world events. Major Pope, USMC, was a graduate of Bowdoin in 1941 and was captain of the state-champion tennis team and a member of Phi Beta Kappa. He fought in the Pacific at Guadalcanal and Peleliu, where he received the nation’s highest military honor, the Congressional Medal of Honor, while leading his rifle company in battle. • A BMCS website, www.bowdoinmarinecorpssociety.org, connecting Bowdoin Marines and providing opportunities for networking, mentorship and periodic gatherings at reunions and commissioning ceremonies at the College or aboard the USS Constitution. The Everett P. Pope Lecture Series will also provide a natural opportunity for annual BMCS meetings at Bowdoin.